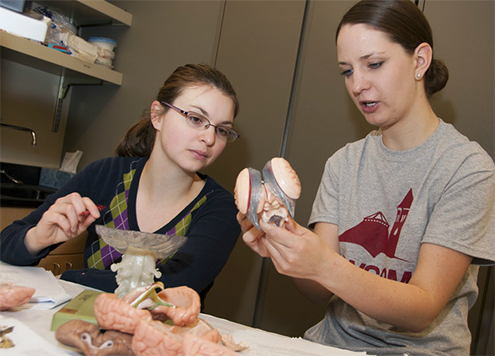 The preparation program at WSU is among the most comprehensive in the nation and offers many opportunities for students to interact and succeed. Because there are many ways to prepare for a career in medicine, we are here to help you map out the path that is best for you. MCAT Scores: Test is made up of 4 sections (Biology/Biochem, Chem/Physics, Analysis and Reasoning, Psych/Soc) scored between 118-132. Total ranging from 472-528.
Letters of Evaluation: 2 from science professors, 1 from an additional professor, 1-2 from physicians, 1 from a professional supervisor who knows you well. See your Pre-med advisor for expert advice. Experience: Significant time spent volunteering in medical and non-medical settings, shadowing physicians, and leadership experience. Research is a plus for many med schools. Evidence of Core Competencies: Medical schools are looking for applicants that exhibit ethical responsibility, capacity for improvement, cultural competence, teamwork, and excellent communication and critical thinking skills. Personal statement: Your opportunity to make a case as to why you are the best candidate. Incorporate why you want to be a physician and steps taken to accomplish this goal (reflection); explain special situations; and describe where you see yourself in the future. Consult with your Pre-med advisor as you craft your statement. The personal interview: Evaluation of students may include the Multiple Mini Interview (MMI) or several 30-60 minute personal interviews. Students should attend mock interviews offered by the HPSC to practice and learn about interview formats and types of questions asked.